Are you looking for a way to set up conversion tracking for Elegant Themes Bloom plugin? Tracking how your forms are doing is important if you want your site visitors to use them. By tracking your form views, submissions, and conversion rates, you’ll know exactly how your forms are doing, and be able to fix any problems. That’s why today we’re going to take a look at how to set up conversion tracking for Elegant Themes’ Bloom plugin. 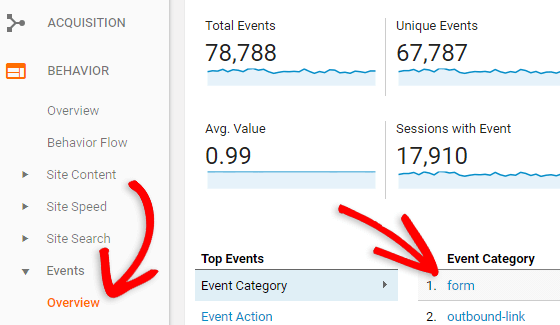 You can manually configure a goal in your Google Analytics account to track site visitor interactions like form views, button clicks, downloads, and form submissions. This process has quite a few steps, so for detailed instructions you can check out our tutorial on creating a goal in Google Analytics to track conversions. On the other hand, if you’re using MonsterInsights, conversion tracking for your Bloom forms is easy to set up. Plus, you can do it all within your WordPress dashboard, making things more convenient. 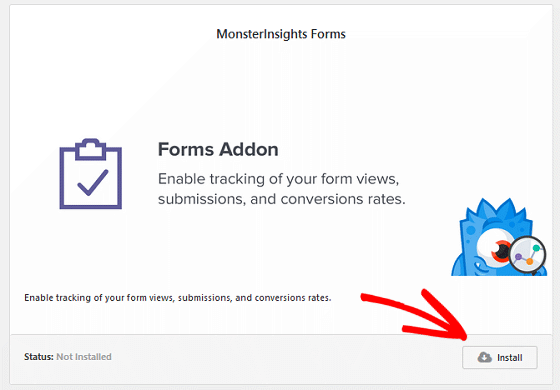 MonsterInsights has a ton of analytics tracking features that aren’t included in Google Analytics by default, including tracking from conversions with the MonsterInsights Forms addon. As you can see, using the MonsterInsights Forms addon is the best option for tracking your Bloom form conversions. To start Bloom forms tracking, first you’ll need to install the MonsterInsights plugin and connect it to Google Analytics. Next, navigate to Insights » Addons and find the MonsterInsights Forms addon. Click on Install and then Activate. And, that’s it for the MonsterInsights Forms Addon. No other setup is needed, since the plugin automatically starts tracking form conversions on your WordPress website. That said, there are a few extra steps needed on the Bloom side of things when it comes to form conversion tracking. Bloom is one of the few major contact form plugins that does not have a built-in feature to give each form a unique ID. This is a big problem when you want to track each form separately. After all, if every different Bloom form on your website has the same name, how is Google Analytics going to accurately determine which forms are converting? Because of this, you’ll need to manually assign each Bloom form on your website a unique ID. Luckily, if you are using Elegant Themes’ Divi Builder, you can do this following the steps below. To start, go to an existing post or page on your website, or create a new one in the WordPress dashboard. Next, place your cursor in an open area so you can insert your Bloom form shortcode. Click on the purple Bloom form button and choose which form you wish to add to your post or page. You’ll need the shortcode in the next step, so be sure to make note of it, or copy and paste it into a text editor for now. 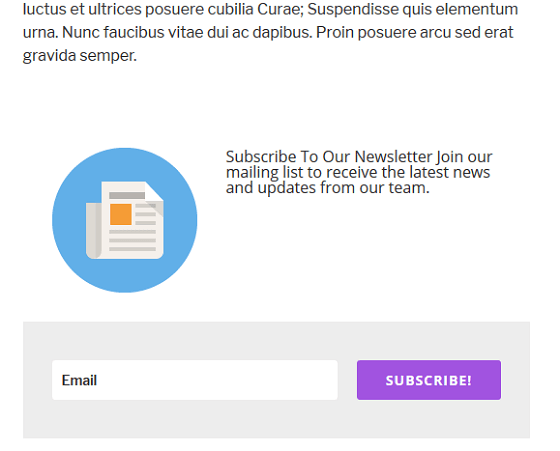 Click on the Use The Divi Builder button. Next, click on Use Visual Builder. You’ll now be on the frontend of your website. 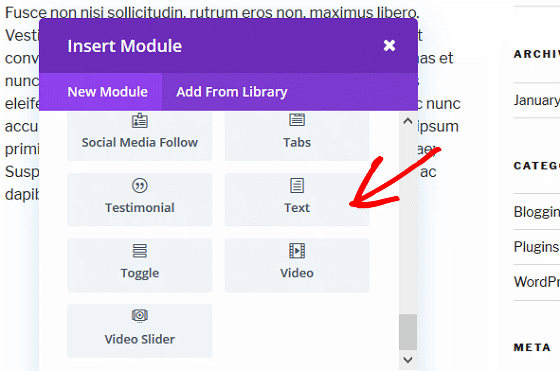 Using the Divi Builder, click on the Add New Section icon. 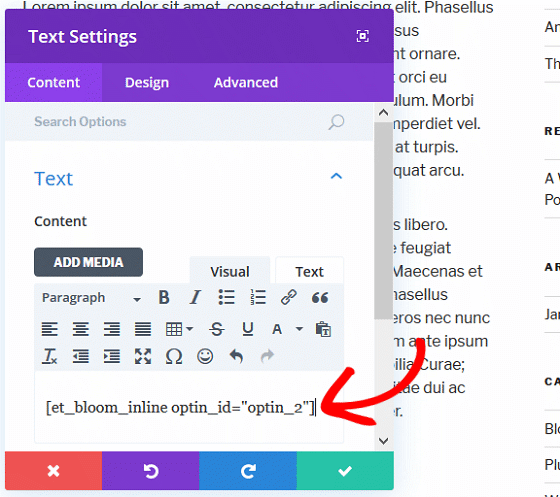 For our example, we’ll add a new section to the bottom of our post’s content, where we want our Bloom form to appear. Insert the type of section you want to add. Your choices are Regular, Speciality, and Fullwidth. We’re using Regular. 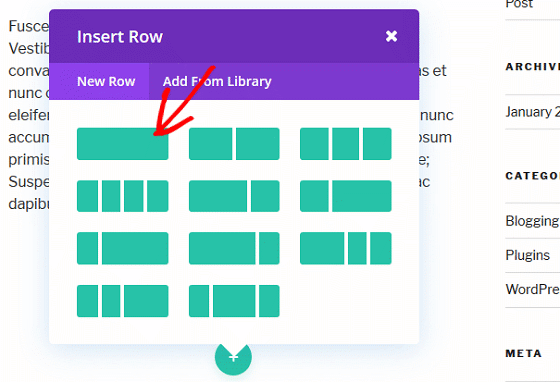 Next, click on the row type you want your section to have. Again, for this example we’re going to use the single row. Scroll through until you see Text and then click on it. You’ll see a popup labeled Text Settings. Under the Content tab, paste the Bloom shortcode. Next, click on the Advanced tab. This is where you’ll assign this specific Bloom form its unique ID. 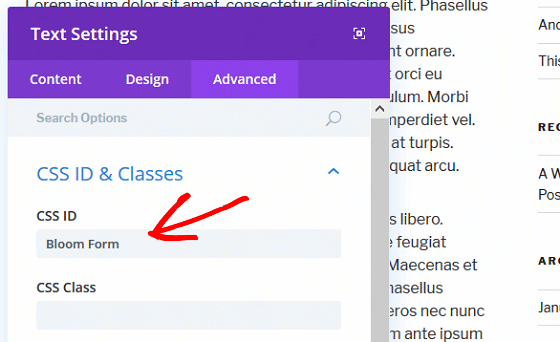 Click on the dropdown menu labeled CSS ID and Classes. In the CSS ID section, give your form a unique name. Remember, every form you place on your website will need a different name so make sure they’re all different. Lastly, click on the green checkmark to save your changes. You should now see your Bloom form in your content. Now that you’ve set up your Bloom optin forms for accurate tracking in Google Analytics, it’s time to see how your forms are doing. 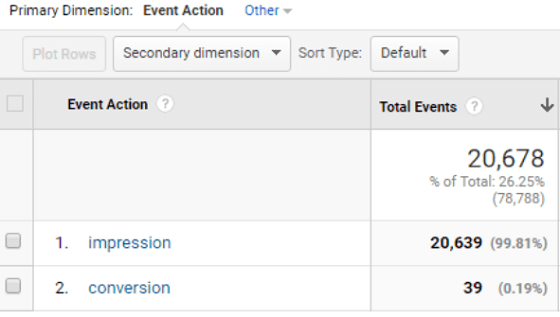 To see your conversion report in Google Analytics, first log in to your Google Analytics account. Next, click on Behavior » Events » Overview and then on form on the right under Event Category. 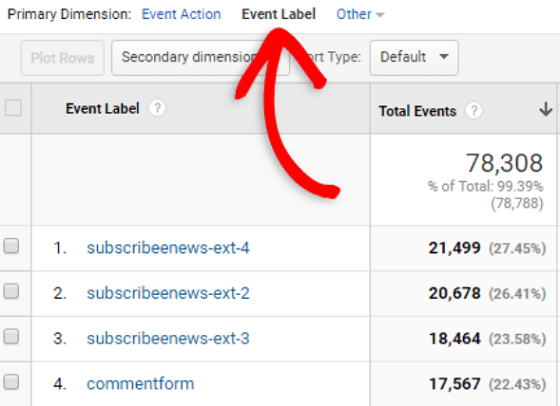 From there, click on the Event Label so you can see statistics for each form you have on your website. Taking it further, you can click on a specific form you want to track, and see how many impressions and conversions it has. 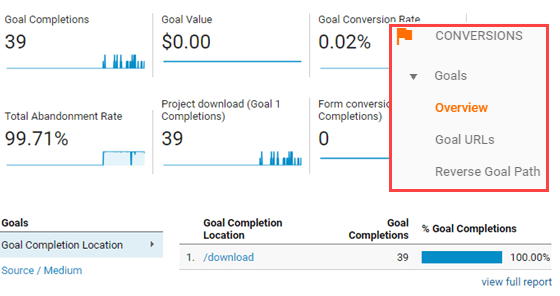 Lastly, if you happen to have set up a conversion goal in your Google Analytics account, you can navigate to Conversions » Goals » Overview to see how you are doing in terms of the goal you set for your form. And that’s it! You have successfully set up conversion tracking for Elegant Themes’ Bloom forms. If you enjoyed this article, you may want to check out how you can use Facebook ad targeting to make the most of your conversions. And don’t forget to follow us on Twitter and Facebook for more Google Analytics tutorials.